StarWind is a one-stop virtualization shop for all the “building blocks” required to construct a full-stack data center infrastructure. We are most certain that the way we combine scalability with simplicity allows our customers to build and scale their environments according to their needs and not according to a limited set of options they're typically offered. 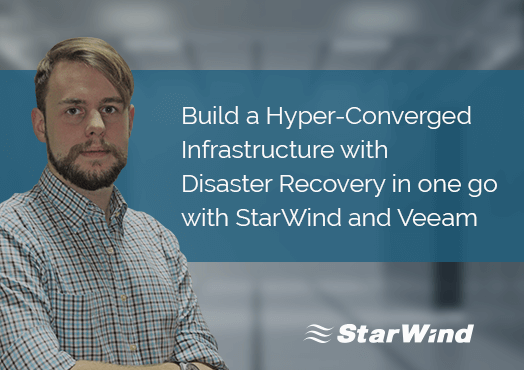 Following this way, StarWind promotes hyper-convergence without condemning the traditional compute and storage architecture, being able to provide the customers with turnkey solutions fitted for their specific cases. A traditional IT infrastructure typically has multiple independent components, often from different vendors. This causes 2 common issues: first, each component requires dedicated management tools. And second: some tinkering is always required to make all components run together smoothly. These issues are partially solved by converged infrastructures (CI). Customer gets a set of separate compute, storage, and networking resources optimized for better interoperability. However, this approach doesn’t solve the administration complexity issues, requiring dedicated tools to manage different parts of the infrastructure. One more CI drawback is non-transparent scaling. Servers, storage, and networking equipment has to be scaled individually. Also, large amount of hardware leads to high CAPEX and OPEX. Yet, all these issues are completely resolved by hyperconverged IT infrastructure approach. Hyperconverged infrastructures (HCI) consolidate compute, storage, and networking resources within a single “building block”. HCI completely resolves the management complexity problem by leaving the “separate components – separate management” approach behind. You simply manage your VMs or applications, instead of dealing with each component individually, while the infrastructure does the rest for you. Ultimately, hyperconvergence grants transparent scaling options, providing the ability not only to scale up by adding more drives, memory, or CPUs, but also to scale out by adding cluster nodes. Also, since there is less hardware to purchase and no proprietary hardware to maintain, CAPEX and OPEX become significantly lower. 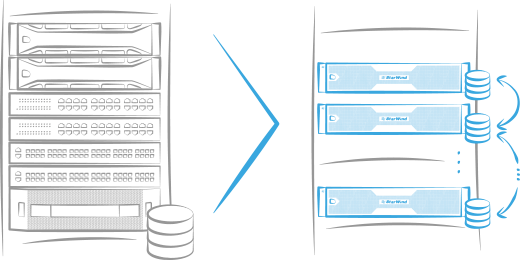 Software-Defined Storage (SDS) is a design where software (instead of hardware) determines storage performance, availability, and resiliency. It provides standard x86 hardware with features that were previously available only in a SAN (i.e., deduplication, replication, snapshots, server-side caching, and log-structuring). With SDS, you can add new features through software updates, not hardware replacement. With SDS, you can focus on applications you want to run, and all the infrastructure resources will be allocated automatically according to requirements you set. SDS saves both your time and effort since there is no more need to manage hypervisor, storage, and networking separately. What is more, SDS makes it easier to build solutions that fit a job by allowing you to switch from proprietary to commodity components. Thus, you get a broader choice of components that are well proven and give you better flexibility. At the end of the day, you really get what you want and not what some vendor is forcing you to buy. Have you ever been woken in the middle of the night by a sudden call from your boss asking to fix your IT environment “right now”? If that’s the case, you probably deal with the traditional support. Standard support puts both troubleshooting and monitoring burden on your shoulders. This model implies constant monitoring your infrastructure to have it running smoothly. When a problem occurs, you can only submit support tickets and wait until the help arrives. In case of a complex issue, multiple vendors will get involved, often resulting in finger-pointing. Meanwhile, your IT infrastructure is still down or severely affected. Generally, this support type is reactive-only. You always fix the already broken infrastructure instead of preventing a failure. That’s where StarWind ProActive Support knocks in. No more waiting for vendors analyze logs or point fingers at each other. Thanks to our advanced AI analytics, we can predict failures before they even occur. Thus, submitting tickets reactively becomes a thing of the past. StarWind ProActive Support brings you peace of mind. It saves you from the endless infrastructure monitoring, allowing you to focus on your business instead. StarWind is a one-stop virtualization shop and the only provider for full-stack datacenter infrastructure you need. 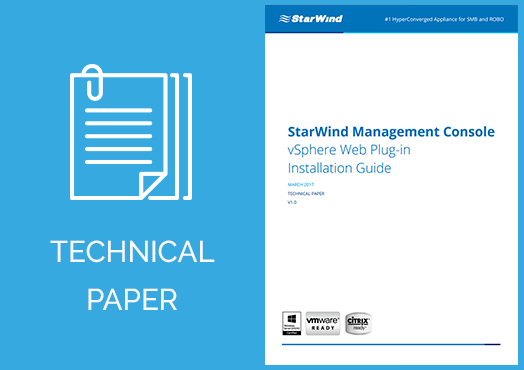 StarWind products are extremely easy to use. A typical system administrator would do the job without any special storage network (SAN/NAS) management skills. Storage appliances for primary and secondary (tier 2, 3, backup) purposes, Virtual Tape Library (VTL), etc. No specialized staff is required on the customer’s side to install and configure the appliances, everything is pre-configured to a point where you just need to plug in the power and network cables. StarWind brings virtualization infrastructure resilience to an entirely new level by putting High Availability “on steroids” and bringing it to Fault Tolerance. 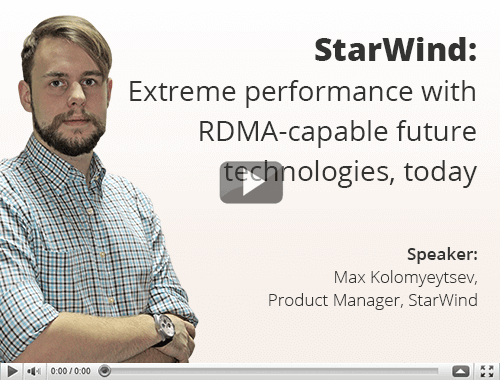 StarWind ensures highest achievable performance of datacenter infrastructure without any overprovisioning. 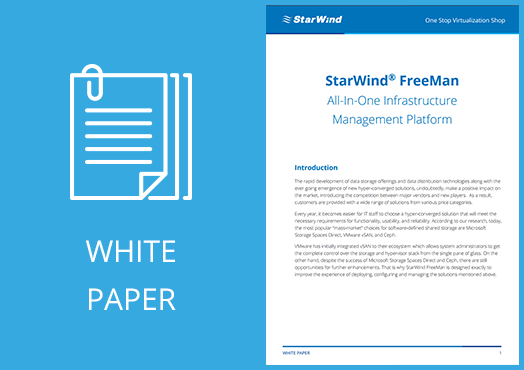 StarWind is cost efficient to the extreme, up to being completely free, and serves a wide range of customers, including the most budget-conscious ones. For those who have sufficient compute resources and need to scale storage capacity without breaking the bank, our solution is StarWind Storage Appliance – the turbocharged storage platform. It serves storage as a single namespace to multiple virtualization environments and easily handles unpredictable data growth. 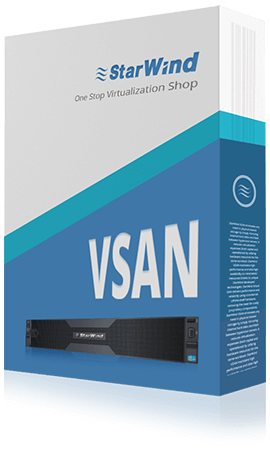 For those, who already have server hardware and need to build a datacenter infrastructure based on the existing setup, our solution is StarWind Virtual SAN – the versatile Software-Defined Storage. It eliminates the need in physical SAN or NAS by “mirroring” disks and flash between servers to create a resilient shared storage.